The University of Illinois at Chicago women’s tennis team consists of three seniors and two junior student athletes, including four European players who traveled thousands of miles to the United States four years ago. 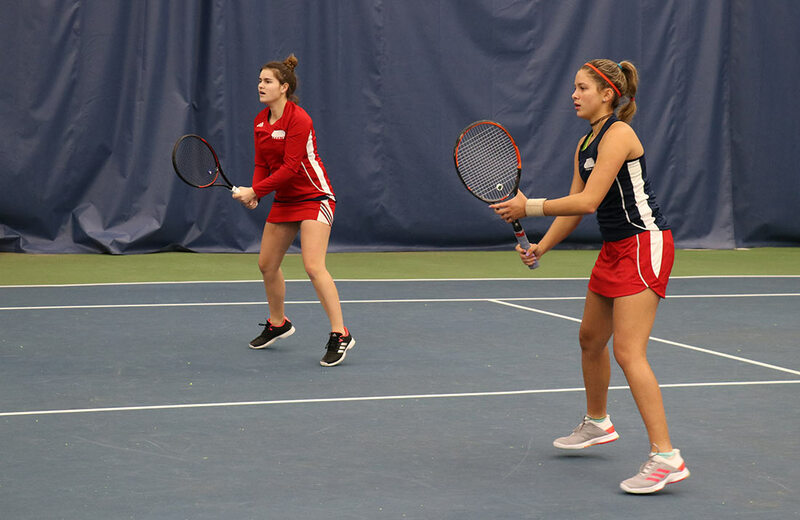 “Who doesn’t dream about being a professional tennis player?” said Lejla Colic, a junior on the UIC women’s tennis team. The Bosnian athlete started playing tennis when she was 4 years old. Colic seemed destined to turn professional following her success on the ITF junior circuit when she was 14 years old. However, she hasn’t been able to carry that top form into more professional tournaments due to injuries, the first of which occurred shortly after the ITF junior circuit. “It was a serious injury. I couldn’t play for two years,” Colic said. Colic tore a tendon in her wrist, throwing her off the path to professional tennis, she said. 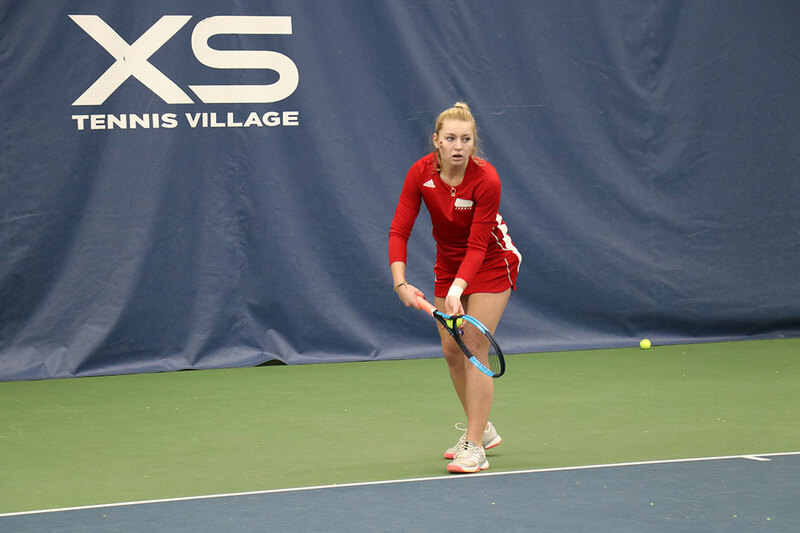 With her love of tennis, in addition to her plan for earning a degree, Colic decided to pursue college tennis in the United States instead of staying in Europe. She wanted to be a well-rounded athlete with a good education and degree. Injuries have played a huge part in preventing other players on the team from pursuing professional play. Despite their young ages, these student athletes have suffered several injuries. They need to receive treatment after classes to keep their physical condition in good shape. As in Colic’s situation, enjoying four-year college tennis and getting a great education besides became a solid goal for these players. And a student athletes’ experience may put them ahead of many candidates in future job searching. Senior Rachel Le Comber, a British native, applied for the OPT (Optional Practical Training) visa, allowing international graduates to work in the United States for a year. She wants to work in the sports industry after graduating from UIC. Tully is optimistic about Le Comber’s next challenge to find a job here. Le Comber realizes, however, how difficult it is for an international student to find a longer-term career in the United States. Companies need to sponsor international employees after the OPT visa expires, which means they are less likely to hire a non-American worker. The collegiate experience boosts Le Comber’s confidence. Le Comber is the only student on the team who has remained at UIC for her entire college career. Her bond to Chicago has been built over the past four years. “Chicago is my second home. There is a running joke that Shannon is our second mom. I got my ‘mom’ here. I have got my friends like my siblings,” Le Comber said. From a freshman rookie to the captain of the team, Le Comber still remembers her first day in Chicago. It was “terrifying, because they all knew each other and things,” Le Comber recalled. “I remember we had a team lunch. It was my first time meeting with our older assistant and spending time with the girls,” she said. Unlike Le Comber, other players on the team are all transfer students. Although they did not spend all four years in Chicago, the players appreciate the college life at UIC. Senior Georgie Sanders from England highly considered turning professional during her freshman year. As the years went by, she realized professional tennis was not going to be realistic. Tennis runs in Sanders’ blood. She is willing to continue playing tennis and stay involved in tennis at various levels. Beside playing tennis, Sanders commands several related work experiences. She interned with two pre-Wimbledon WTA tournaments in Nottingham and Birmingham in the U.K, In addition, Sanders worked in the media center at Wimbledon throughout the past three years. “Being involved in the tennis world and in the sports business industry somehow would be ideal,” Sanders said. Sanders will graduate in May with a degree in psychology, but she is ambitious to continue her academic pursuits and is considering an MBA..
“I have applied to UIC graduate school to do my MBA program. I took my GRE test last week and now I am waiting to hear about my admission decision,” Sanders said. Sanders is more well-traveled than the average 21-year-old student because her father is a pilot. Sanders traveled globally for tennis tournaments with her father when she was a teenager. “We went to some pretty cool places. I have had experience with other cultures,” Sanders said. Sanders’ parents expect her to go back home after this summer, but the British player wants to stay in Chicago and complete the MBA program. Sanders will exhaust her four-year eligibility playing for the UIC women’s tennis team at graduation, according to the NCAA guidelines. Tully plans to offer Sanders a position working with the team. “She is the only one really pursuing a master’s degree. If she does get accepted, my plan is to make her my graduate assistant,” Tully said. The NCAA has many regulations for player eligibility for transfer student athletes. The transfer schools also regulate what credits they will accept when a student transfers and what additional academic requirements a student may have to meet. Senior Viktoria Seifert will not graduate with her peers this May. She needs a fifth year at UIC to complete all the required courses, she said. With this special scenario, Seifert can’t play for five years but plans to work in the athletic department during her fifth year. Even though Seifert has another full year of school, she has decided to go back to Germany after completing the bachelor’s degree. Seifert’s older sister is finishing a master’s degree in finance in Germany this summer. She influenced Seifert’s decision to major in accounting. Since she has a year remaining in school, Seifert has not confirmed her future career path specifically. “I want to do some internships to gain working experience to figure out what I do like and what kind of field I am interested in,” Seifert said. Despite the uncertainties they may face, the seniors agree on appreciating their time in the United States. “It was the best four years I had in my life,” Le Comber said.